They say that a gold mine is hidden in those trees. 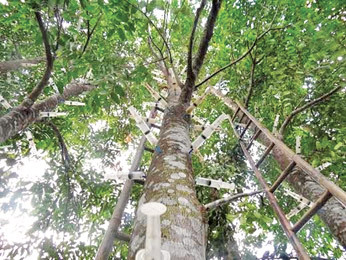 Just two days ago, two people were arrested at the Bandaranaike International Airport for trying to smuggle out 16 kilograms of bark parts of this tree. To the scientific world this plant is known as 'Gyrinops walla' and to the villagers as walla patta. 'Patta' is a Sinhala word used for the parts that are taken from the tree bark to be used in place of string or cord for tying purposes. This particular tree had been mostly used for this purpose in villages apart from a few medicinal uses. Yet, today, going beyond the village level walla patta has become a rich resource for the world perfume industry, one of the most expensive products of the modern world. 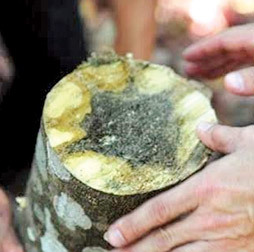 The black resin which develops inside the bark of Walla Patta due to a fungal infection in the tree is used to extract agarwood oil which is used heavily in the modern perfume industry. Agarwood oil itself is used as a perfume and is a favourite in the Middle Eastern high end market. Thus it has come under eyes of smugglers. Walla Patta is a commonly seen sub canopy tree that grows in home gardens in the wet zone and in intermediate zone forests. And it is reported to be found in Western Ghats, India too. The commercial value of this tree came to light with the recent attempts to illegally fell and smuggle it to extract Agarwood. There are several other plant types which could be used to extract agarwood and 'Gyrinops walla' is one of it. "Agarwood, also known as oud, oodh or agar, a dark resinous heartwood that forms in some genera such as 'Aquilaria' and 'Gyrinops' in the plant family Thymelaeaceae," said the Director General of the Department of Botanic Gardens, Dr. Siril Wijesundara, one of the few expert botanists of the country. "Botanists knew for sometime that 'Gyrinops walla' trees had this quality. It got a high commercial value only after the perfume industry started widely using the agarwood oil extracted from it. Earlier a plant species called 'Aquilaria' was widely used. Though it is still used, 'walla patta' seems to be more popular," said Dr. Wijesundara. He said that when this wood is damaged and gets infected with a certain type of fungus an oleoresin is produced - which is the black coloured part of the tree trunk, which is seen when it is cut. At present, due to the pressure on these plant species for its high commercial value it has been included in the Appendix II of the CITES - the international convention against illegal trade of wild fauna and flora. "In 1995, among the agarwood producing plant species only one species, 'Aquilaria malaccensis', was listed in CITES Appendix II," Dr. Wijesundara said. As the demand from the industry was sky rocketing, by 2005, more Agarwood producing species including all Gyrinops species were listed under CITES, he said. In Sri Lanka 'Gyrinops walla' was included under the vulnerable category because of the current situation, as Dr. Wijesundara said. The end product, agarwood, is a precious and luxurious product, and the quality of the aroma is an indication of status and prestige. North-East Asia and the markets of Taiwan, Japan, and the Republic of Korea and Middle East are major centres of agarwood consumption. As reported from Thailand, a kilogram of Agarwood (walla patta resin parts) costs US $ 9,500 to 19,700. Thus it gets major attention in the illegal trade. "What we need to do is to minimise the damage that happens to forests when people illegally cut down walla patta growing in forests. And at least now Sri Lanka should start sustainable exploitation of this valuable resource," he said. Taking the example of cinnamon, Dr. Wijesundara added that today hardly anyone exploits the forest to get cinnamon as the commercially grown ones are available in plenty. "The most important factor is to have a strict monitoring mechanism when growing walla patta commercially," he said. He said it is not mere exporting raw material we should focus on. "Extracting oil through distillation is a simple process. There is a market for agarwood oil - both in pure and blended with other fragrances and as perfume products in the high end market. Only a strict monitoring system can assure the high quality of these export goods. But it has the potential of benefiting the community as a sustainable trade as well," he said. The Sri Lanka Customs on one instance caught a person who has been sending 'agarwood' pieces through courier to destinations such as Dubai, Singapore and Paris in small quantities with high value. As Deputy Director of Customs Samantha Gunasekara explained since June 2013 up to September nearly four major cases of smuggling walla patta were detected. "The person who sent agarwood through courier had been sending them as 'sambrani' (incense powder). Because of the high price one can receive these smugglers take any risk to take agarwood out of the country even if they get fined," Gunasekara said. "A Customs officer has only two factors to catch these smugglers - one is that these plant species come under regulations mentioned in the CITES as it is categorised under it and the other is that no one can export Sri Lanka's forest produce," he said. Yet if a person shows a permit from the Department of Forest Conservation they can take the forest produce out of the country. And since walla patta is also grown in home gardens there is no restriction in exporting them too. For a long time Sri Lanka was under the threat of being a transit point for the illegal fauna and flora trade. Smuggling of walla patta is now the new addition. "Unless we strictly control this it will badly affect the export market based on natural resources," he said.